This loop is a good mix of cross country hiking and trail hiking although it starts out on a dirt road. The hike begins at the mouth of Isham Canyon. After hiking a ways up the canyon and then a side canyon, the route follows a trail to the west and stops just short of the radio facilities at the end of Quarry Road before dropping into an unnamed canyon. Upon reaching the bottom of the canyon the route turns west and heads back along the foot of the Slate Range to the mouth of Isham Canyon. 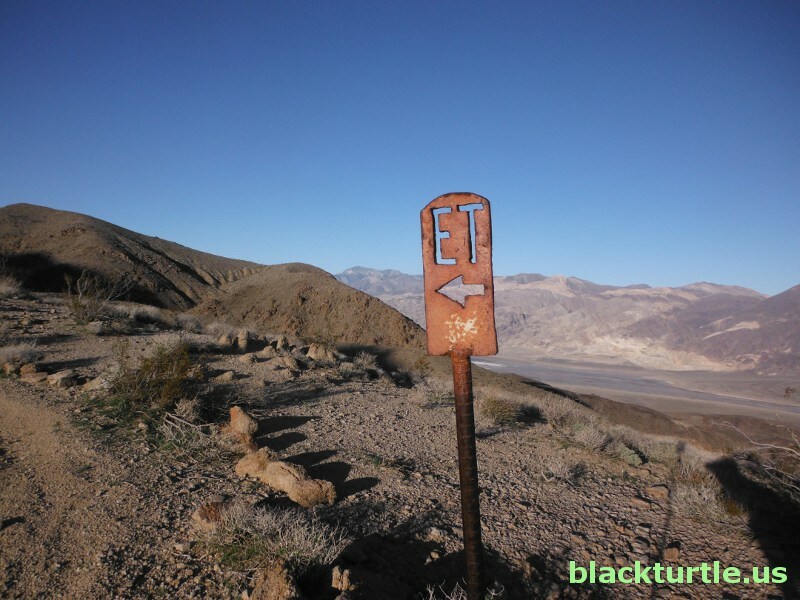 TRAILHEAD: Drive 3.6 miles north from the Inyo County line marker on Trona Road (Highway 178) and turn right (east) onto P68 at the "Valley Sand and Gravel" sign. Drive 1.7 miles and turn left (north) onto P67. P67 is not always properly signed, but it can be found at the bottom of a dip just before the ruins of some kind of ore processing facility are reached. In fact, after turning left onto P67 you drive right by some of these ruins as you head off to Isham Canyon. Shortly after passing through the ruins make sure to stay left where an illegal road continues more or less straight ahead. The mouth of Isham Canyon is reached after about 1.4 miles. Park a couple hundred yards short of the mouth of the canyon. It is possible to drive about half way up the canyon in a normally equipped off-road vehicle. The top half of Isham Canyon is somewhat famous as an obstacle course used by off-road enthusiasts to test their rock-crawlers. There are many videos on YouTube showing some of these people and their rigs. Manly Pass is found at the top of Isham Canyon and can be reached by continuing on P68 and veering left at about two tenths of a mile beyond the ruins previously mentioned. Follow P68 several miles and turn at P67 to reach Manly Pass the back way, utilizing a normally equipped off-road vehicle. HIKE DIRECTIONS: Begin by hiking up Isham Canyon, following the dirt road approximately six-tenths of a mile to a side canyon that begins at a pullout area and heads northwest from the main canyon. There are a few obstacles encountered in the side canyon that will require a little scrambling. One requires a fifteen foot climb, but can be easily bypassed if necessary. Follow this side canyon all the way to the top and veer west out of the wash and follow an old road about a quarter of a mile to a trail that heads west. Stay on the trail until an altitude of 3515 feet is reached at a little more than three miles from the trailhead. Find the top of the unnamed canyon shown on the map and follow the canyon all the way down to its mouth. The middle part of the canyon is somewhat rough and requires some easy rock climbing. None of the obstacles are impassable, but the route by one may not be immediately obvious. Once out of the the canyon turn east and hike along the foot of the Slate Range back to the trailhead. Along the way you will pass by several drainages which may prevent you from hiking in a direct line back to the trailhead. A. Manly Pass Extension - Instead of turning northwest at the pullout area, just continue up Isham Canyon. Once to the top of Manly Pass find the closed road that heads north and follow it until it becomes the trail described above. C. Donkey Trail / Saddle - While hiking down the unnamed canyon a saddle is encountered about 200 yards before reaching the rough part of the canyon. Just east of the low point of the saddle is an old donkey trail that makes hiking up to the saddle easy and convenient. You may elect to hike the 100 yards up to the saddle just so you can obtain a view of the canyon to the west. D. Mine in Unnamed Canyon to West - From the top of the saddle follow a rough and steep drainage to the west into the unnamed canyon. Hike up the canyon about a third of a mile to a mine tunnel and explore the area around the tunnel. Next you can follow the road down to the mouth of the canyon (E on the map) and then proceed east to the trailhead. This extension probably adds a little over a mile to the route distance.